Following the spectacle of the Progress tour which saw Robbie Williams rejoin the ranks for the run, Take That return to the stage for their first headline tour as a trio. Whilst the venues may have been downsized from outdoor sporting arena to indoor concert halls for this headline tour, the boys are still capable of putting on one hell of show. In fact, Take That Live 2015 is arguably their most ambitious tour to date. Big, bright and bold, the show kicks off with the boys emerging from centre stage in brightly coloured suits to the ticking beat of III album track I Like It. 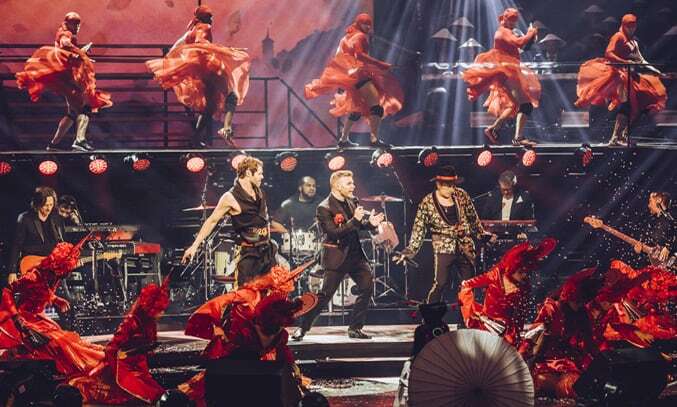 Like previous tours, theatricality is at the core of Take That’s 2 hour show, with elaborate props, rising sets and 27 performers delighting the audience with mime, acrobatics and contemporary dance. The staging is wacky and wonderful as dancers rise from secret trap doors for a stomping performance of Love Love, before moving into an enchanting performance of Greatest Day, Hold Up a Light and Patience. From futuristic geishas to flying bicycles, shadow puppets and giant jellyfish, the boys certainly aren’t afraid of putting on an ambitious show. The set saw the boys sing a mix of songs from early Take That classics such as Could It Be Magic and Pray, to modern hits such as Patience and These Days as well as tracks from the new album III like Flaws and Get Ready For It. It was the classic sing-alongs that really bewitched the crowd, particularly Rule The World with its epic chorus and Back For Good which saw the boys take a break to sit on stools for throwback slowie as they settled in to their velvet harmonies. The highlight of the show was the performance of Let In The Sun in which saw an acrobat spin around inside a magnificent ball of light (complete with pyrotechnics) for an incredible display which took over stage. The performance finished with an encore of Shine and the Take That classic Never Forget which left the audience wanting more. Despite being two members down, it’s clear that Take That’s creative spark remains fully charged. A curiously compelling pop experience that is well worth the ticket price!